Country Wide Walling specialises in concrete palisade walling and precast retaining walls, along with other walling types and requirements. Country Wide Walling have been in the manufacture and erection of concrete and precast walls for over 25 years, and are the new leaders in the walling industry. As the demand for good, quality concrete walling and fencing has grown, Country Wide Walling has grown with it. 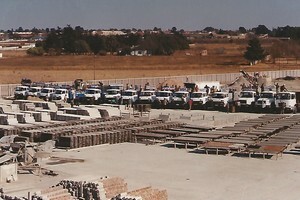 In these 25 plus years, we have been creating the best quality precast concrete walls in South Africa. S.A.B.S. test methods are used on all our products. Country Wide Walling erects over 8km of precast walls, retaining walls and concrete palisade fencing per month, and all our work is done Professionally. Country Wide Walling use our own contractors, and offer our clients a product direct from the factory, with a 2 (two) Year Guarantee. 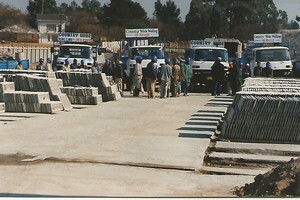 Country Wide Walling manufacture a full range of products to meet your needs. Over the years Concrete Palisade Fencing has become extremely popular due to it’s durability, and maintenance free applications. This is especially true where large scale walling is required, and it is now being chosen over steel palisade, as it is theft proof and maintenance free. We have a great variety of walls available to meet all your needs. Industrial and Domestic walling, single and double-sided brick walls, raising of existing walls, facebrick precast walls with, or without steel inserts, razor wire, sliding gates. 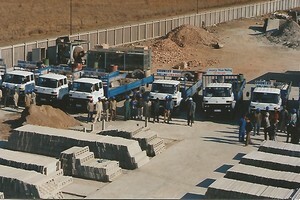 Basically, we can supply any type of retaining walls. Satisfied builders and homeowner across the East Rand and Gauteng will testify to the quality of our products and the professional services we offer. Whether you need walls or gates, Country Wide Walling is the trustworthy brand you will learn to love. We take pride in our workmanship, and the quality we bring to our clients, and, once completed, it will show in the completed work on your property. Your satisfaction in our guarantee! As we take pride in our workmanship, you will take pride in your next wall or gate installation. Our promise to you, our valued client, is that we will work together as a specialist team of experts. We will provide you with outstanding services and earn your trust in our abilities, service and workmanship. f experts. We will provide you with outstanding services and trust in our abilities, service and workmanship. Should you require more information on concrete palisade fencing or precast retaining walls, please do not hesitate to contact us.